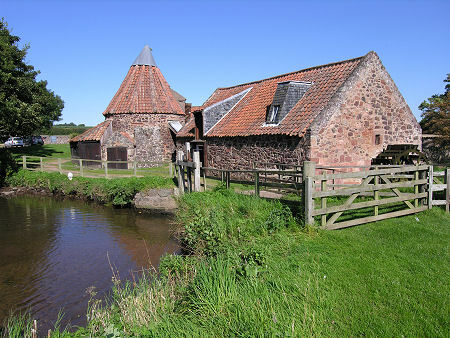 Preston Mill is one of the oldest meal mills in Scotland with its machinery still in working order. It lies close to the River Tyne a few hundred yards downstream of East Linton. Since 1951 it has been owned by the National Trust for Scotland and it remained in use as a commercial mill until 1959. 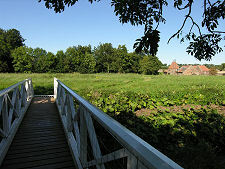 The mill complex comprises three main buildings: the kiln, the mill and the miller's house. 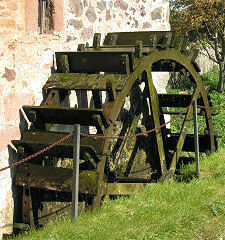 Externally, the mill stands to the east of the mill-pond, the "header-tank" for the supply of water to power the mill. This in turn is fed via a mill-lade bringing water from the River Tyne. From the mill pond the water enters a channel which leads to the water wheel. The wheel you see today dates back to a refurbishment of the mill in 1909 and comprises an iron structure to which a series of wooden paddles are attached, though at the time the photo on the left was taken, a number of the paddles were missing. 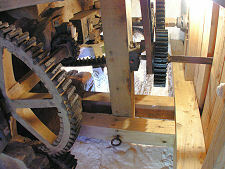 If you take one of the regular guided tours of the mill and the kiln, you can see that the square shaft on which the water wheel rotates comes through the wall of the mill to drive the first in a series of large gears which, between them, form three power-trains driving all the milling operations. An interesting feature is that if you follow the transmission of the power from cog to cog, you find that the machinery is designed to ensure that metal gears only ever come into contact with wooden gears, and vice versa. Internally, the main mill building is on two floors. A mill has stood on this site since the end of the 1500s, and while part of the structure you see today dates back to the 1600s, the mill was developed and redeveloped in at least four stages in the three centuries to the early 1900s. 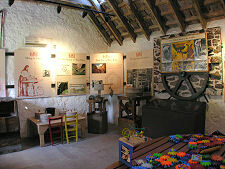 Today the interior of the mill comes complete with examples of much of the machinery that would have been used in mills of this type, most of it dating back to the late 1800s or early 1900s. 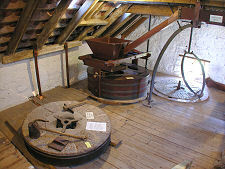 Preston Mill had two sets of grinding stones: the first to separate the husks from the shelled oats (or groats); and the second to grind the groats into oatmeal. All of the processes within the mill were designed to allow this double-cycle of milling to take place, and to ensure that the various products, ranging from husks, through animal feed, to oatmeal and wholemeal flour could be effectively separated and sacked. 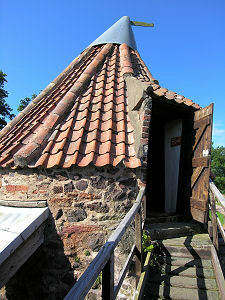 From the upper floor of the mill building, a walkway leads to the top of the kiln. It is the kiln at Preston Mill that is the real star of the show: a beautiful and fascinating building that looks as if it grew organically rather than being built by the hand of man (and certainly not to any design ever committed to paper). It is no wonder that Preston Mill has over the years been a very popular subject for artists: with the combination of mill wheel, pond and remarkable kiln there are few more striking and unusual compositions anywhere. The role of the kiln was a simple but vital one, to dry the oats before they entered the milling process. 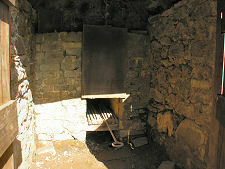 A coke-fired oven can still be seen on the ground floor, and from here heat rose to the floor above, where oats were laid out to dry. 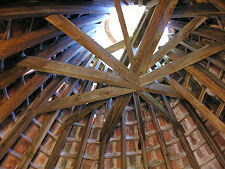 The interior of the squished conical shape of the roof of the kiln is supported by a network of wooden beams, while a hole in the centre of the roof let out the smoke from the fire. This is topped off with a cowl that swivels in the wind and keeps out the rain. 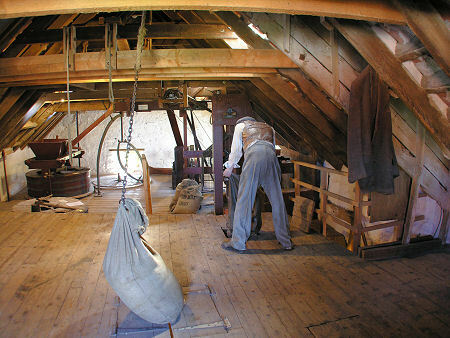 It was normal for the miller's house to be separate from the mill itself. Mills had a habit of burning down, and it made sense to avoid losing the miller's home as well, in the event of fire. At Preston Mill part of the miller's house forms the visitor reception and ticket desk, while the remainder is given over to a series of displays about mills and milling. One thing to watch out for on the west side of the mill building are a number of inscriptions showing the levels of a series of floods that afflicted the mill during the 1900s. During the worst of these, in 1948, the waters of the River Tyne rose to above the upper floor of the mill building. 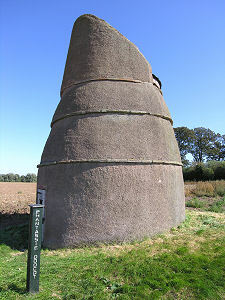 A quarter of a mile south of Preston Mill, over a white footbridge across the River Tyne and along a very narrow road besides a field, is another National Trust for Scotland property, Phantassie Doocot. Doocots, or dovecotes, were once a very common feature of the Scottish countryside, providing a good source of meat over the winter, but they became less popular once ways were found of keeping other livestock fed - and available for eating - over the winter. 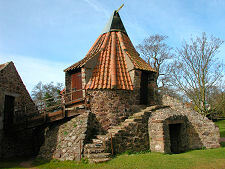 Phantassie Doocot was probably built in the 1500s. 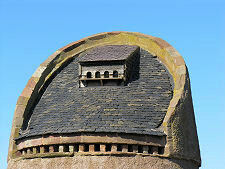 It shares a number of features of the fairly common "beehive" shaped Scottish doocot, but is unusually cut off at the top to form a south facing slope through which the birds could access the nest boxes within. The Phantassie Doocot is named after the Phantassie estate on which it stands, perhaps best known as the birthplace in 1761 of the engineer John Rennie.